Last weekend we had the Isuzu Kitesurfnationals. The forecast looked great an the wind really showed up in Podersdorf! 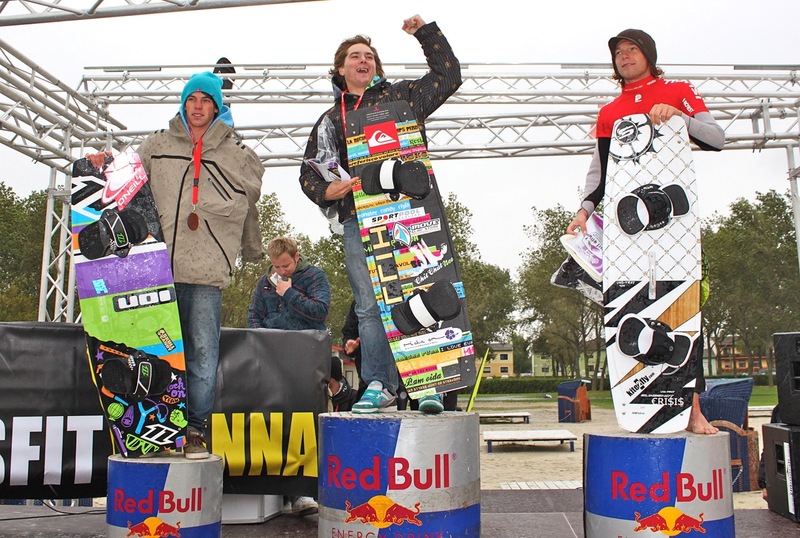 On Friday we had the regestration and in the afternoon the wind got strong enough so we startet the Freestyleheats. The wind was pretty light and I was on my 13 all day long. I had some good heats but in some heats it was almost to light to ride. Anyway I made it into the final against Stefan Spiessberger who really got style in his kiteing and also does all the tricks from the worldtour. Unfortunatly just when we wanted to start our heat the wind died and the racedirector had to cancell the heat and we called it a day. On Saturday not much happend because the wind wasn’t picking up the whole day so we chilled a lot and relaxed after a lot of kiteing on Friday. On Sunday a bad weather front was arriving in Austria and with that the wind got very strong with up to 35 knots. In the morning we ran the singleelemination final. As said I was up against Stefan and I knew that I would have to give everything to beat him on the water. I managed to land some good tricks and in the end it was enough to wind the heat and the singles. Due to the strong wind they cancelled the races and started with a doubleelemination instead. It took them the hole day to run the heats till the finals. In the late afternoon it was time for me to prepare for the last final and I went out on my 7 to warm up. In the heat between Stefan and Dominik Müller, which was about who is going into the final, Stefan did a bad movement and dislocated his shoulder and had to give up. So the final of the nationals was Dominik against me. He was riding really good and showed some nice passes but I also had a good heat and so I was able to beat him and win the nationals this year. I’m really happy about that and it feels so good to be the number 1 in Austria again after a break of two years because I had to be at worldcup events when the nationals happened. In all the happienes I feel very sorry for Stefan because I know he trained so hard for this day and I’m sure we would have had an amazing final against each other. But he will come back for sure! My father also did a great job and got Austrian Champion in the Masters-Class. Not bad for a guy over 50 and he really earned this titel! Showing handlepasses, unhooked stuff and some sick kiteloops he even impressed me! I also wanted to thank everybody for their help on the beach and anywhere else this weekend. A special thanks goes to my girlfriend Carina, Daniel and my family!!! This entry was posted on Tuesday, September 28th, 2010 at 10:42:55	and is filed under news. You can follow any responses to this entry through the RSS 2.0 feed. You can leave a response, or trackback from your own site.